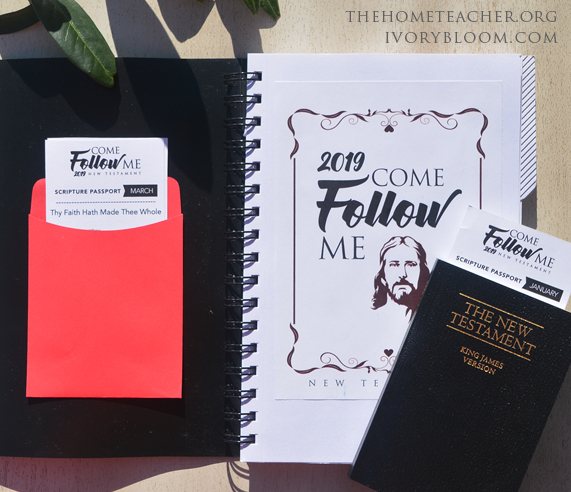 You might have heard about the New Testament Come Follow Me curriculum the church has released for 2019. Maybe you are overwhelmed about the whole thing and don’t know where to start. 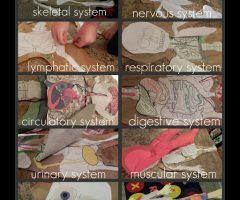 Or maybe you are excited and just want more ideas to add to your teaching tool belt. If so this blog post is for you! We are following the lessons provided in the Come Follow Me manual. If you aren’t a member of the Church of Jesus Christ of Latter Day Saints it’s OK- this curriculum is for ALL who want to be more converted to Christ. It’s a bible based curriculum and is written for anyone that wants to learn more about Him and His teachings. 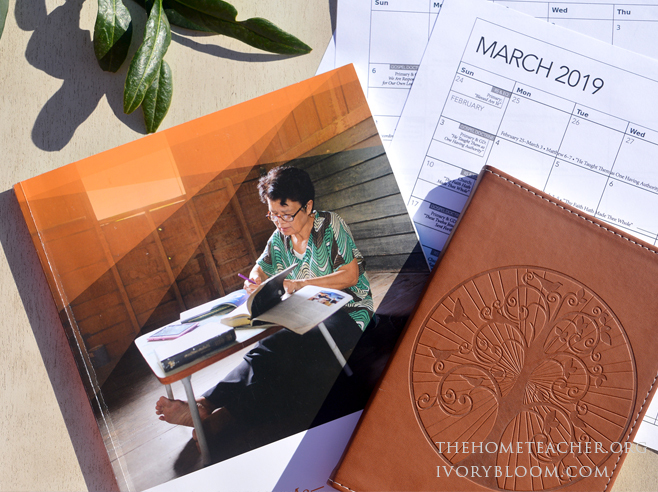 First things first, don’t be stressed out thinking you have to do a bazillion new things or that this curriculum is designed for professional educators. This program is designed for YOU. For your family. Doesn’t matter where you are religiously, your family dynamics, or your current knowledge of the New Testament. In fact, if you look at it closely, it is actually a simpler approach to what a lot of you are already doing. 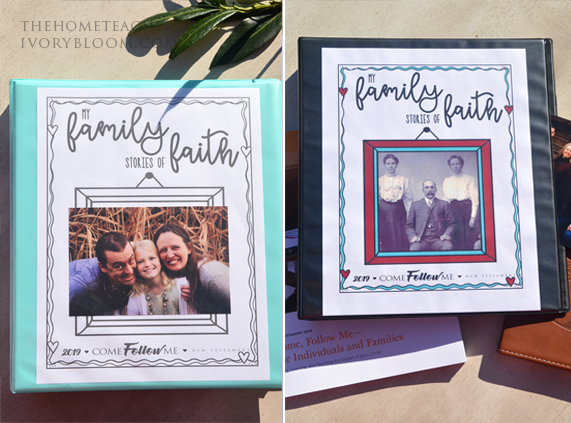 This curriculum is family scripture study and family home evening lessons rolled into one (with the added bonus of church teachers going over the same topics on Sundays). For those of us who are old enough to remember the old family home evening manuals you know how easy they are to use. This program is similar and aligns beautifully with the New Testament and our goal of conversion to Christ. 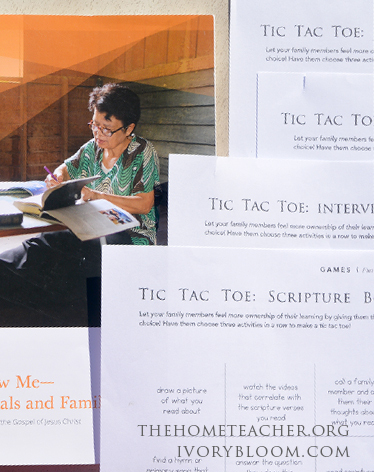 In this post we interchangeably use the phrases “family scripture study” and “family home evening” but they both refer to the same thing- a special time each week where gospel learning takes place in the home. We plan on using this new curriculum on Sunday and then spend one day during the week doing an activity that corresponds with the lesson. Do what works best for your family. One of my FAVORITE quotes by Steven Covey is to “begin with the end in mind”. We ultimately want to begin with the end goal of conversion- no matter where we are individually on our spiritual journey, the goal is simply growing and strengthening that relationship with the Savior. To help carry out that principle of beginning with the end in mind we find that it helps to have a game plan before beginning the program. This blog post covers some basic tips that can help you plan your year- to ultimately make this the best year of family scripture study EVER!!! 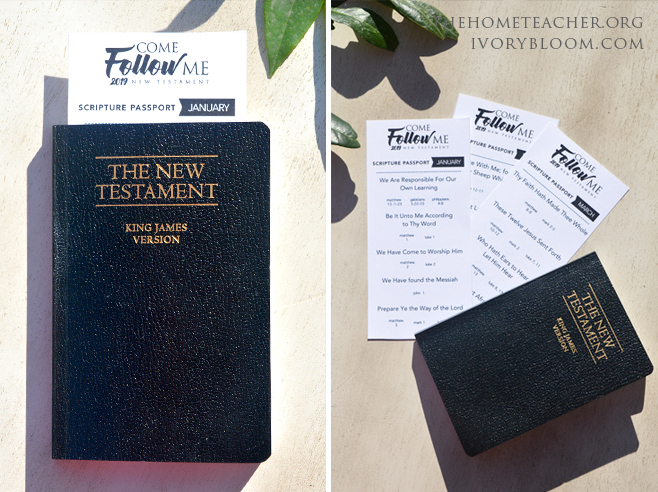 You are about to embark on a journey of the New Testament with your family. You have your scripture suitcase and your excitement to read … all you need now is your passport. The scripture passports list each week’s reading passages. Kids can get stickers or small stamps to place on their passport as they complete the weekly reading assignment. It would also be super easy to just color in the circles. Just think- by the end of the year your child could have 12 completed passports that show their adventure with the New Testament. 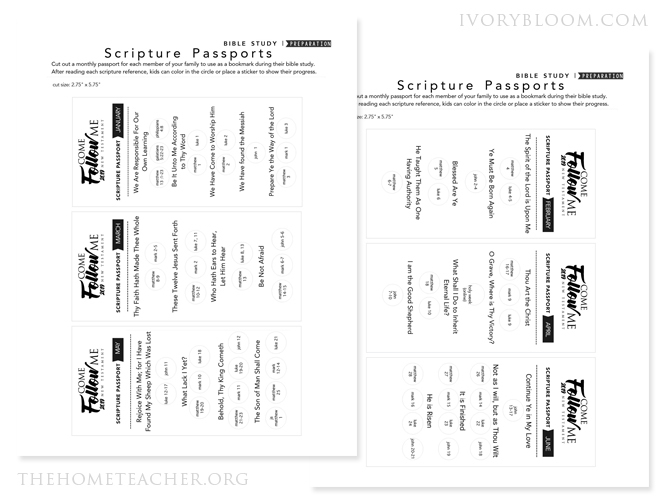 Click on the pic below to download the Scripture Passport PDFs for January- June. You can use these passports as bookmarks- easy peasy! You can also place them in cute little library card pockets and place them in little bible books or bible journals for your kids. What is a bible journal? Read on….. Mom, I am having a difficult time connecting topics from week to week in church and would really like a strategy to help me make those connections. It would be great to document my learning in a fun way that is individualized and yet can help me remember the scriptures. We know making personal connections and reflecting on your learning is an INCREDIBLE tool we can use during family scripture study. 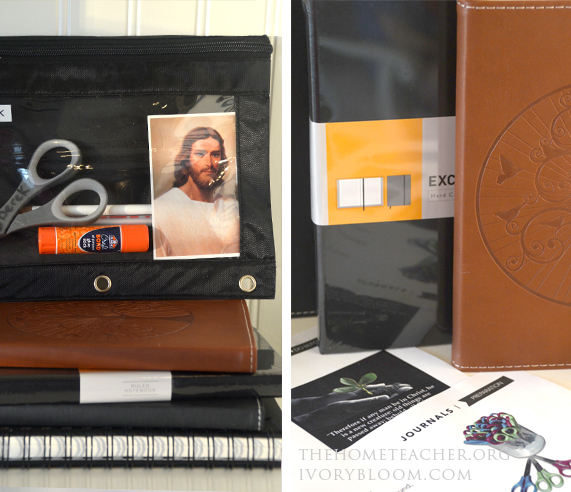 And what better way to document all of this than with a cute journal or bible book. 🙂 This will be the place where kids can write questions, summarize the scriptures they just read, draw pictures of their favorite bible stories, add pictures of faith centered family field trips (more info on that at the bottom of this post), insert stickers, cut and paste little charts and information about the weekly topic… whatever works for you and your family! 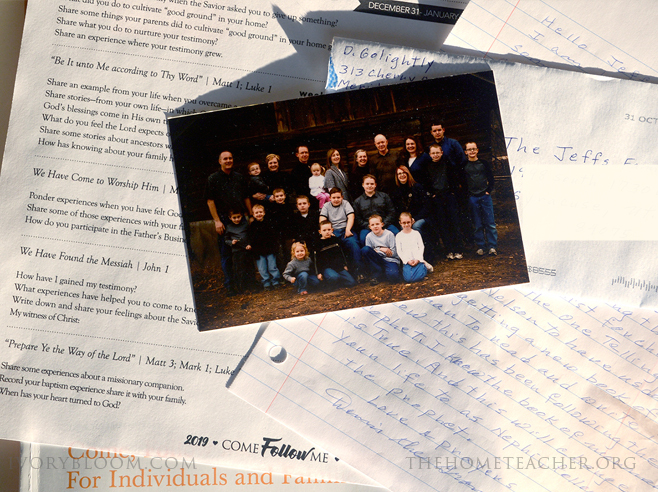 The goal of this journal is to have a physical reminder of each family member’s conversion to Christ through the New Testament. Everyone will journal differently, and that’s OK. My husband has agreed to write notes and reflections on a google doc. That is what will work best for him. My daughter will probably include dragon pictures on several pages of her journal and that’s ok- this is a book of her conversion, not mine- and I want to keep this a positive experience and not one where I am dictating my personal opinions. 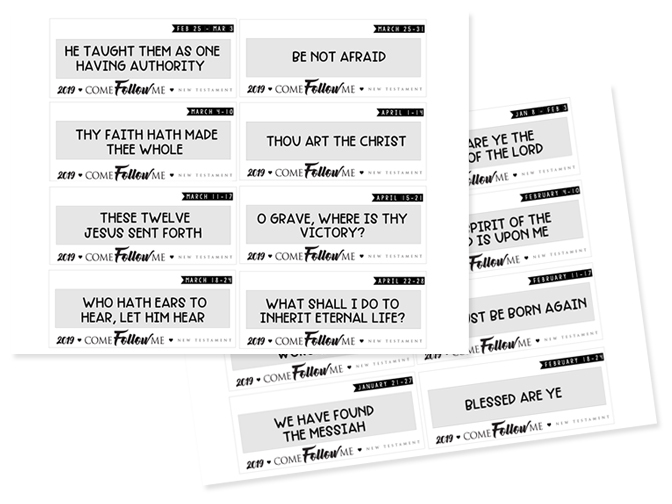 We will have printables for each weekly theme for your family to use in their scripture journals as they see fit. You can have them make a collage of their favorite quotes, answer some of the questions, … whatever will work best for your family. To download the introductory journal pages, click on the image below. 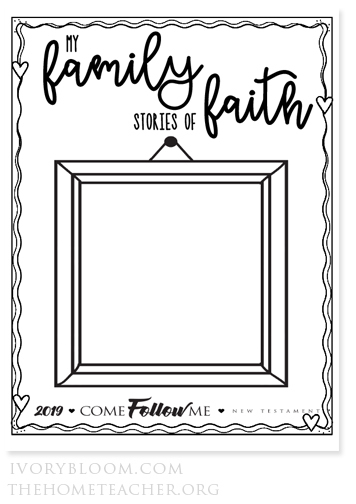 This will include some printables you can use in your scripture journals before 2019 to prepare for the year. 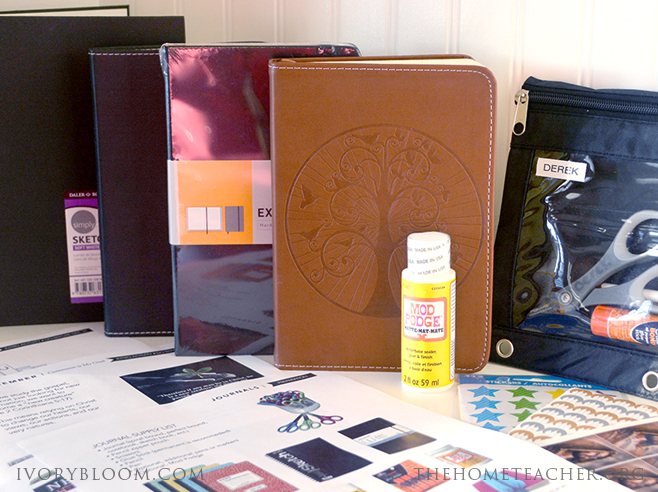 There is also a list of some ideas of what to include in your journal/ supply kits. We can’t emphasis enough the importance of making connections to solidify your learning. Whether it’s through previous experiences or things that you are going through today, take the time to reflect on how the scriptures and gospel topics connect to you. 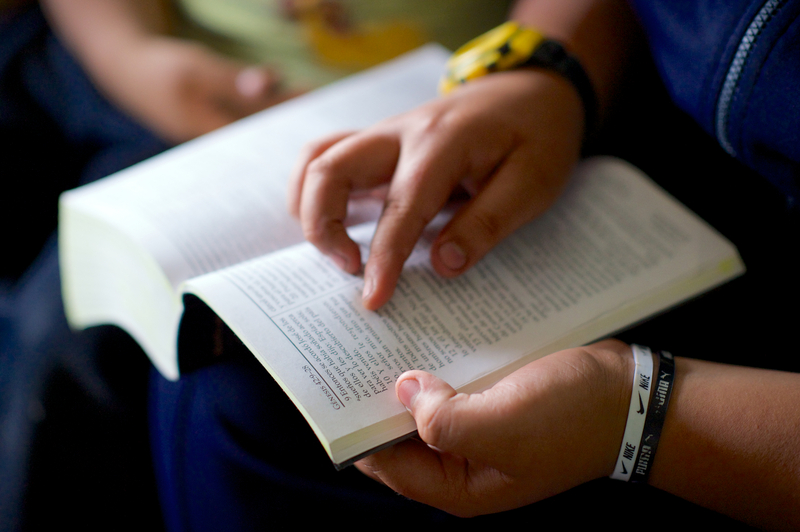 The scriptures will mean more to us if we can make them connect to us. We can make connections to our scriptures through family history! We are both genealogy nerds and want to share what we have learned about our ancestors with our families. 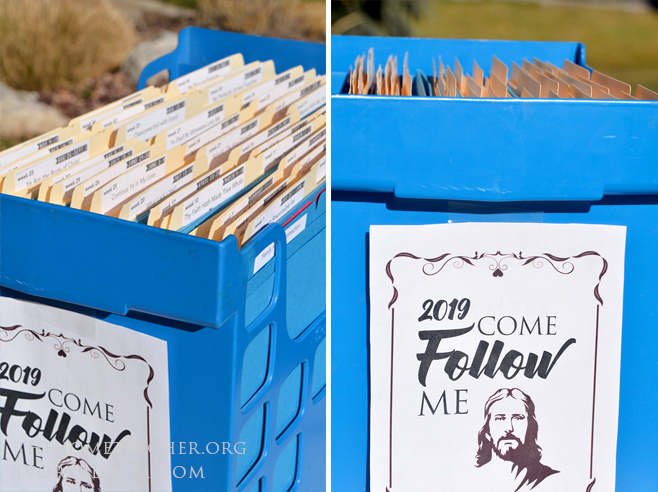 One way to incorporate family history connections in your gospel study is to find a story of an ancestor that goes with each weekly theme. You can place the story and a picture of that ancestor (if available) in a family history binder. Imagine- by the end of the year you could have 52 stories of ancestors! If you can’t find stories that go along with each weekly theme, share conversion to Christ stories or stories that you feel will benefit your family the most. Click on the Family History Binder image below to download the cover. You can also make great connections to the scriptures through service! Christ was the ultimate example of serving others. Let Him guide you to others in need of a helping hand. Allow others to serve your family by sharing their conversion stories with you. Take advantage of grandparents or people in your ward. Be sure to include what you learned in your bible journals. We also had the idea to take pictures of your child with the person they interviewed to help them remember their experiences. Click on the January 2019 Questions for grandparents link to download a list of interview questions. It’s a good idea to share this list first with grandparents or those your child will be interviewing so they can have time to ponder on how to best answer the questions. 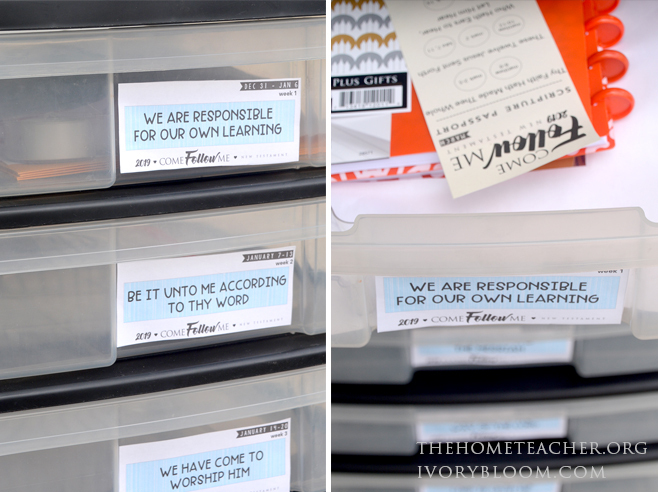 Keeping your ideas organized can make for a more efficient family home evening or scripture time. Believe me- I have wasted so much time sorting through ginormous stacks of papers looking for things. 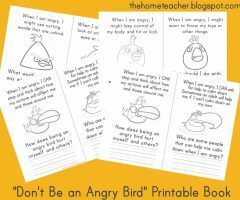 Organization now can be a wonderful framework so you can focus on the meaning of the lesson and not have to worry about those handouts that mysteriously disappeared. 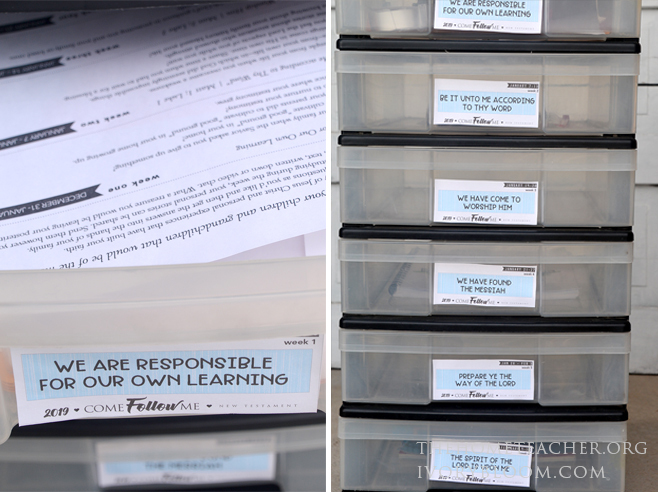 There are several ways you can organize your printables, learning materials, and ideas. Choose a system that works best for YOU. And don’t be afraid to change it up a bit if it doesn’t work for you… For us, organization makes us happy (and partially sane) and so finding the right system was important. But not everyone is like that- you might thrive better when things aren’t so structured and that’s totally ok! Just take what works for you and OWN it! 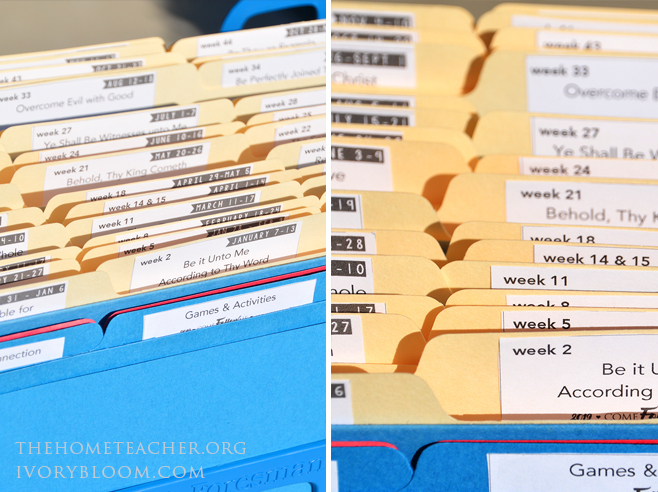 This is a great solution in keeping those handouts, lesson plans, pictures, etc. sorted. Pros? Folders are inexpensive and store materials neatly. 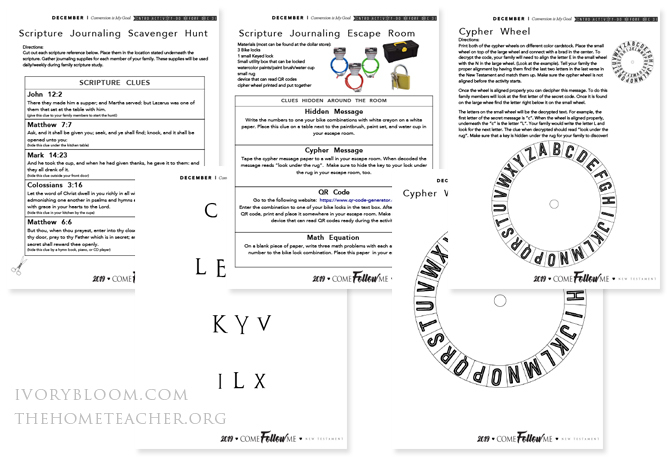 This system allows you to easily add materials for upcoming lessons- you could even organize materials for the whole year if you’re feeling adventurous! Cons? A lot of extra work if you don’t plan on having handouts or extra materials. 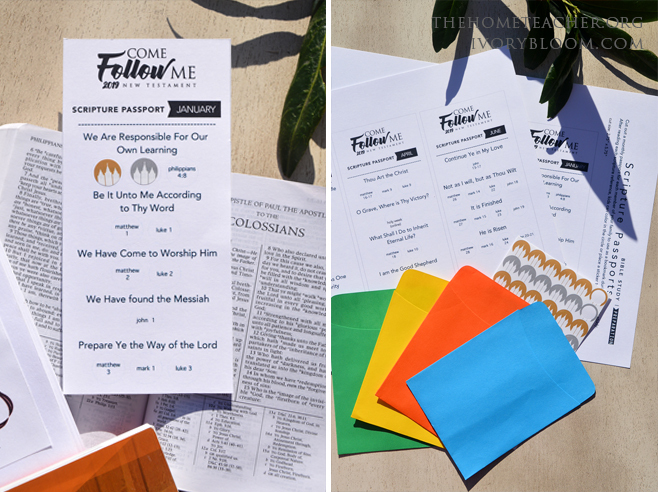 Download the Come Follow Me file folder labels by clicking on the image below. I love the idea of grabbing our plastic drawer for the week full of activities and journaling supplies, plopping down on the couch, and starting our family scripture time. That’s the beauty of the plastic drawers. 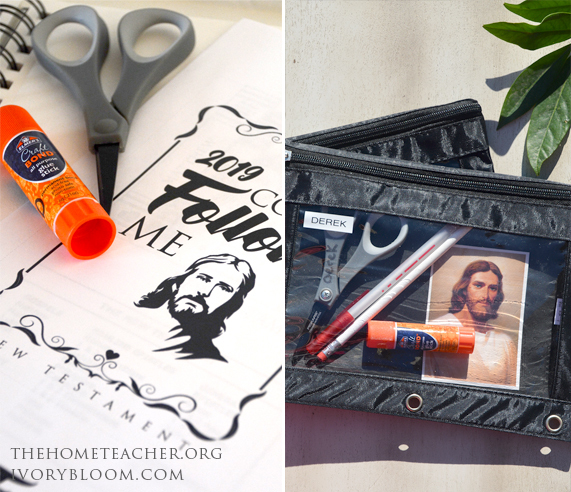 They are clear so you can see what materials are inside, they are big enough that you can add some craft materials or a church DVD, and you could plan a few weeks in advance. Pros? It’s beautiful, organized, and allows you to add bigger items that a file folder can’t . Cons? Expensive. And there’s not a drawer for every week of the year (that would be REALLY expensive) so you would have to change out contents of the drawers regularly. But it’s so cute that I think it might be worth it! Download the Drawer Labels by clicking on the image below. This is a great option for those that want the efficiency of file folders but with the added perk of portability. You can easily grab this and carry your family home evening plans without papers falling everywhere. Pros? Prices range depending on your budget, it’s easy to carry, and you can close it. Cons? Like the plastic drawers, there aren’t enough spaces for every week so you will have to update your files every so often. Mapping out your activities and ideas is a great way to organize your thoughts. As you read the lesson each week in preparation to teach your family, impressions will come to mind on different strategies or materials to use that will make a difference. Write these down. The Spirit will guide you on how to teach this curriculum specifically for YOUR family. 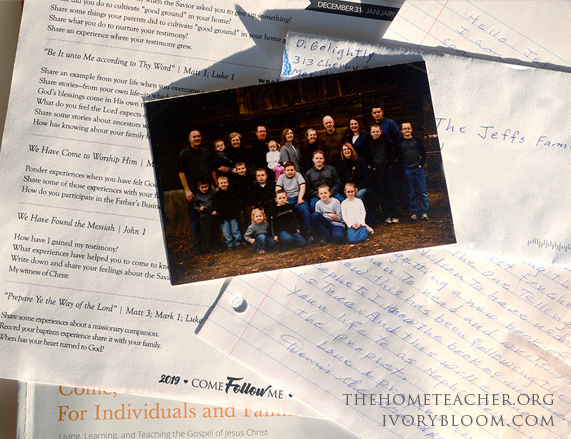 Our family home evenings will follow a basic outline- song, prayer, lesson, reflections, etc. Nothing too over the top. Using a simple structure like this each week will help our children to begin teaching gospel centered family instruction. 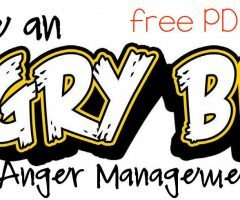 Click on the Monthly Planner or Weekly Planner links to download the PDFs. You are not alone if this whole curriculum thing sounds a bit confusing. A calendar is a great way to visually map out when you are teaching each topic and when you are learning about that topic in church. It’s also a great way to add special family activities or service projects during the week that correspond with your weekly lesson. 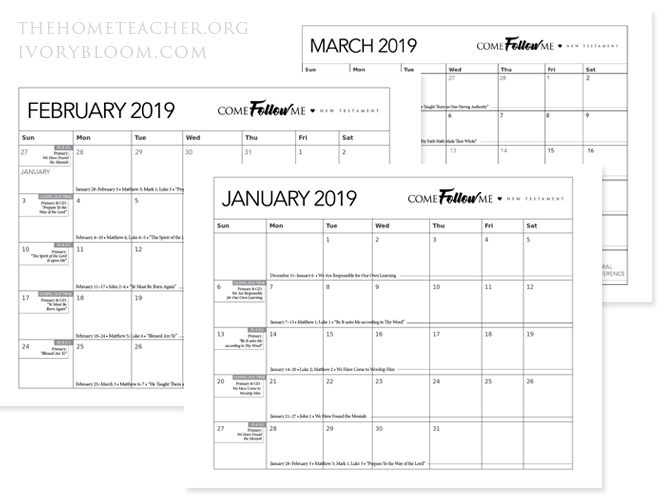 Click on the image below to download the calendar for the first three months of 2019. 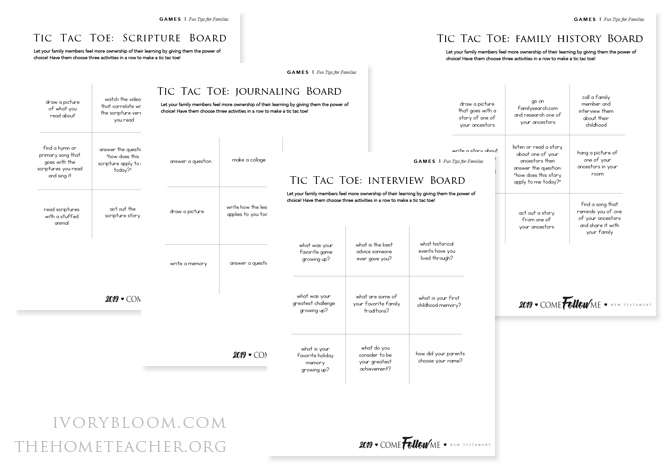 Your new family home evening/family scripture study curriculum can be EXCITING for your kids! How, you may ask? The first thing is to be enthusiastic yourself. Find something you are genuinely excited about- maybe it’s the extra time spent learning the gospel with your family, organizing the materials, making bible journals with your kids, or helping your kids be more converted to Christ. Let that excitement- however small- be the spark for your family night flame. 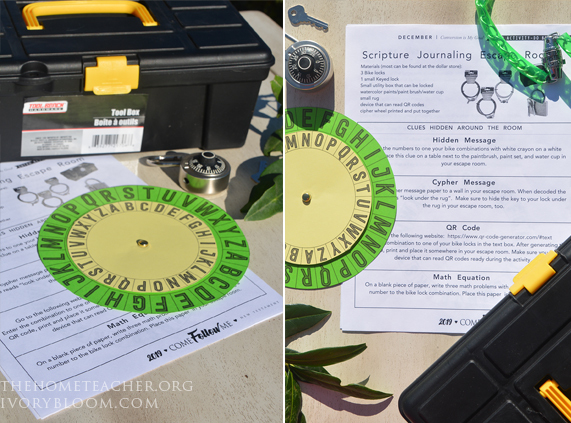 If you choose to do scripture journals with your family, why not make getting their supplies a great adventure! 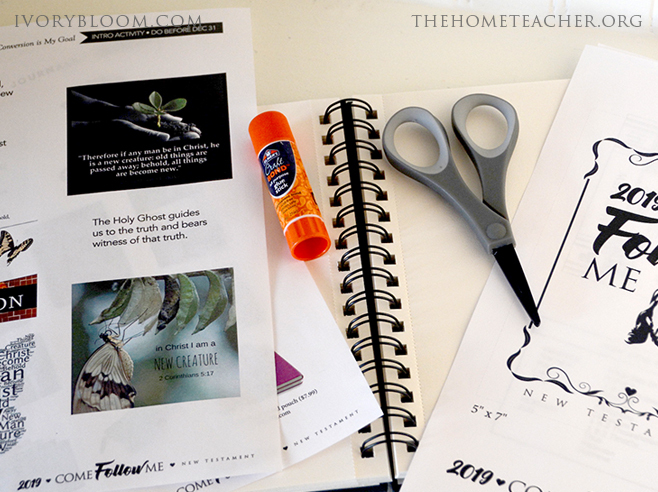 Prepare your kids by making this activity like a top secret mission. You can create intriguing invitations with manilla envelopes that explain their mission (escape room or scavenger hunt), special security name badges, … all very official to peak your child’s interests. We came up with a fun little escape room that is sure to get even teenagers excited. If an escape room seems like too much work, we came up with a simpler scavenger hunt that can be used in your home. Both of these activities have the same prize at the end: their new scripture journals or notebooks and supplies. Click on the image below to download the Scripture Scavenger Hunt/Escape Room activities. Give your family the power of choice while learning gospel topics. A basic tic tac toe board allows kids to choose three activities to complete (as long as they are in a row). Anna had a great idea to laminate the boards and reuse them every so often. Click on the image below to download the Tic Tac Toe activity boards. 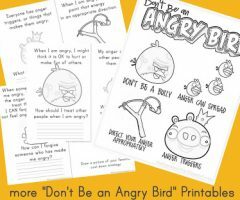 Use the power of parties to make learning fun! Have a New Year’s theme party to kick off your study of the New Testament. Host a little heart party in February to get your kids excited to do service for others. Grab some glow sticks and have a night party in the dark talking about the power of Christ’s light in our lives. It can be as simple as inviting neighbors over and munching on popcorn while watching bible videos. You may want to have little celebrations with your family as they complete their scripture passports or memorize scripture verses. The possibilities are as endless as your imagination. Teaching is a great way to learn. Give your child time each week/month to share their favorite parts of the lesson or their favorite pages in their bible journals. We plan on having small neighborhood sharing times which will work GREAT for me since my tween is all about her friends right now. I imagine our sharing times like a combination of show & tell and a mini book club. I don’t think it will take longer than 15 – 20 minutes to share and eat treats. Keep in mind what will work best for your family- maybe a community sharing time is too intimidating for your shy child or your teen would enjoy having an online sharing time using social media. Mix it up by taking your family on a special outing to help them deepen their understanding of the gospel principles discussed each week. If you talked about the beautiful earth God has given us- head over to the park or outside in your garden and chat about their favorite things about our world. If you talked about temple work- drive to the temple and walk around the grounds. Stop by the laundromat and talk about how just like washing clothes, repentance can make us clean. 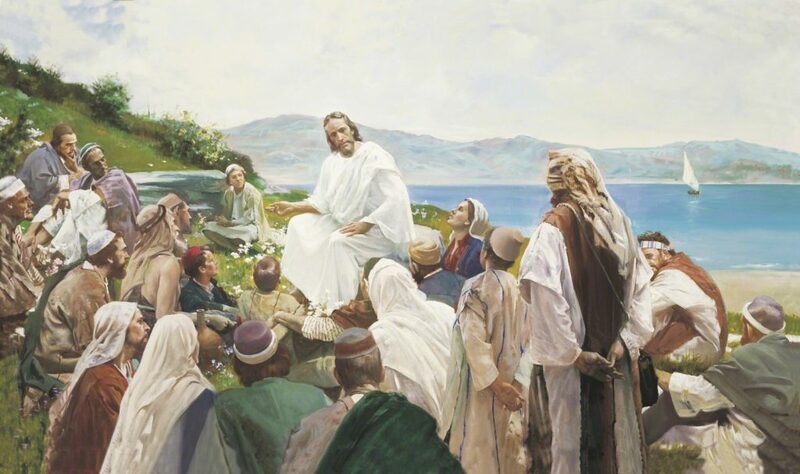 While learning about the miracles of Jesus, go to a bakery to pick out some yummy bread (or visit a local fish market) and talk about how Christ was able to feed a large crowd with just five small loaves of bread and two fish. If you are at a loss on field trip ideas have no fear- we will have some suggestions for each weekly theme. Again, do what works best for YOU. Don’t worry about what the neighbors’ are doing because their family needs will be different than yours. And worrying about keeping up with someone else might prevent you from getting those specific impressions from the Spirit that will help you and your family be more converted to Christ. I am SO blessed to be working with a professional graphic designer on this project. Anna‘s initial enthusiasm for the new curriculum got me super excited (I get easily excited when it comes to lesson plans haha). We are two moms with two different talents who wanted to use these to help you implement this program into your home. 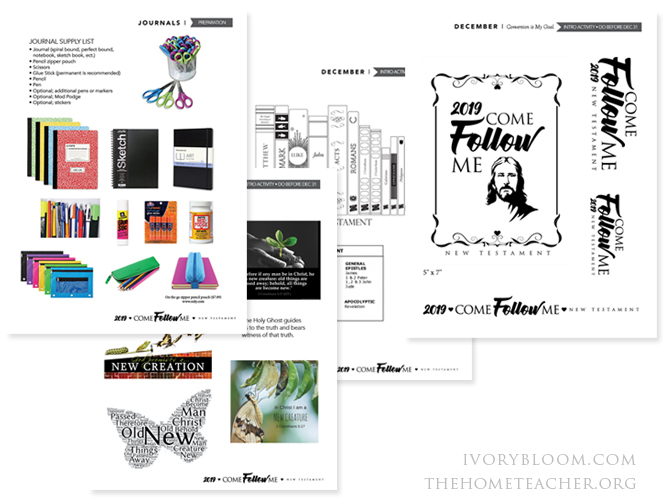 LOOKING FORWARD TO UPCOMING POSTS…..
comefollowme.lds.org – this website has pretty much EVERYTHING you could ever need to start the Come Follow Me curriculum: the manuals, links to media resources, instructions… please check it out. This entry was posted in church, faith & family, fhe on November 25, 2018 by ktoponce. Well thought out ladies. You are both amazing. This is just what I have been thinking of doing but my schedule has been so FULL I haven’t had the opportunity to organize my thoughts. Thank you for being willing to share all of your hardwork. We will definitely be taking advantage of such a great resource. God bless. Thanks Kristen! That means so much to both Anna and I!! Your excitement and enthusiasm is contagious! Thank you for sharing all your wonderful ideas and resources!! Thank you for this. I’ve been searching for something like this but everything I found looked so juvenile. This will appeal to my teenages and older primary children. I love it! This is amazing! Thank you so much for sharing your gifts and talents to bless all of our lives!